Thirty-one students and teachers representing each of the Thirty Meter Telescope International Observatory partner countries gather in Hilo this weekend for an intensive five-day forum on astronomy and engineering. The United States is represented by eight students and three teachers from St. Joseph School, Kealakehe High School, and Kamehameha Schools-Hawaii. An additional 15 high school students and five teachers from Canada, China, India and Japan are also participating. The third annual Pacific Astronomy and Engineering Summit (PAES) provides high schools students with a forum for in-depth learning and collaboration. Hosted by the ‘Imiloa Astronomy Center of Hawai?i, the Summit is made possible through the support of the TMT International Observatory and the Mauna Kea Astronomy Outreach Committee, with cooperation from the Hawaii Space Grant Consortium and University of Hawai?i at Hilo. Worldwide, there is growing demand for workers trained in science, technology, engineering and math – commonly referred to as STEM. The Alliance for Science Technology Research in America estimates that by 2018, Hawaii alone will need to fill 29,000 STEM-related jobs. Expanding exposure to STEM programs and professionals is critical for preparing Hawaii’s youth for these opportunities. The summit schedule will include “hands-on/minds-on” workshops and experiential learning on topics ranging from indigenous engineering, exploring optics, and the composition of meteorites, to finding exoplanets with digital cameras, making a telescope, and simple robotic programming. Students will have opportunities to interact with scientists and engineers, including many associated with astronomy on Maunakea, to exchange ideas and solutions that advance their shared interests in STEM disciplines. “Science education and partnerships are critical to creating tomorrow's researchers, educators, inventors, and technicians, and it is they who will continue to use science, technology, and culture to inspire the exploration of our Universe, the advancement of our society, and the preservation of our Earth for future generations," said Henry T. Yang, chairman of the TMT International Observatory. “In this age of globalization, technology allows us to communicate and collaborate across borders, and the experiences these students share over the next five days will result in friendships and working relationships that last for years to come,” he added. Rounding out the summit will be immersive experiences in ‘Imiloa’s Exhibit Hall and Planetarium, leadership training exercises, and off-site field trips for stargazing and to explore Hawai?i Volcanoes National Park. The students will also be sharing cultural presentations on their home countries and cultures. The attendee list for the 2015 summit includes Kehan Yang, a member of the Chinese delegation who was the winner of the TMT Engineering Challenge at the Intel International Science and Engineering Fair. Yang’s wall-climbing WiFi-based Reconnaissance Robot uses negative pressure absorption, four-wheel drive, and is controlled by a cell phone Java application, which transmits digital and video signals simultaneously to an embedded wireless module on the robot. The light robot materials were produced using 3D-printing technology. Another summit participant, a Kamehameha Schools student from O?ahu, recently represented the state of Hawai?i at the Intel International Science and Engineering Fair. For more information, about the 2015 Pacific Astronomy and Engineering Summit, contact Margaret Shiba, Director of Institutional Advancement, 'Imiloa Astronomy Center, mshiba@imiloahawaii.org or visit http://www.paes.hawaii-conference.com. ‘Imiloa Astronomy Center of Hawai‘i is a world-class informal science education center located on the University of Hawai‘i at Hilo campus. ‘Imiloa is a place of life-long learning where the power of Hawai?i’s cultural traditions, its legacy of exploration and the wonders of astronomy come together to provide inspiration and hope for generations. The Center’s interactive exhibits, 3D full dome planetarium, native landscape, and programs and events engage children, families and the local community in the wonders of science and technology found in Hawai‘i. For more information, visit the website at www.imiloahawaii.org. 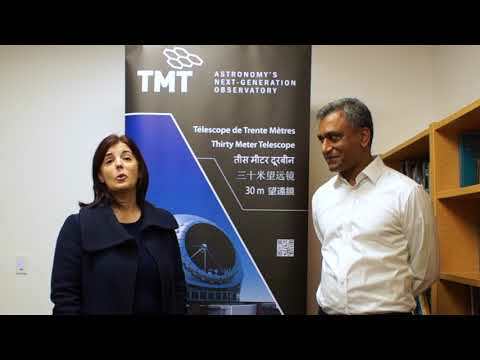 Thirty Meter Telescope International Observatory LLC, a non-profit organization, was established in May 2014 to carry out the construction and operation phases of the TMT Project. The Members of TIO are Caltech, University of California, the National Institutes of Natural Sciences of Japan, the National Astronomical Observatories of the Chinese Academy of Sciences, the Department of Science and Technology of India, and the National Research Council (Canada); the Association of Universities for Research in Astronomy (AURA) is a TIO Associate. Major funding has been provided by the Gordon & Betty Moore Foundation. For more information, visit tmt.org , www.facebook.com/TMTHawaii or follow @TMTHawaii.